Ethan slept like a dream last night. Aircon is a must as its so humid here. It’s as if you are constantly in a sauna. It’s 37.5c as I sit here and write this at 9pm! We woke up, showered, fed little man and packed up. 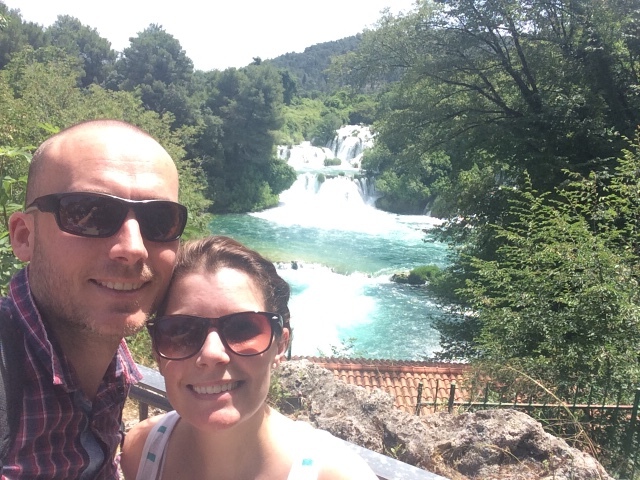 Out of the apartment by 9 and on the road to Krka. He was good as gold and fell asleep straight away. 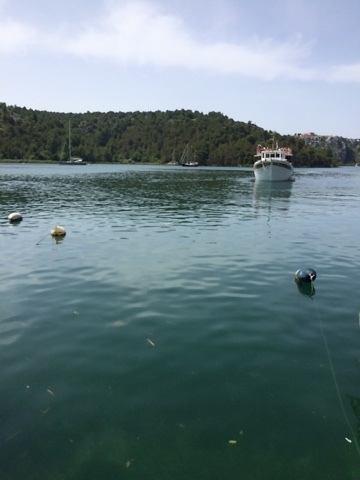 This gave us the opportunity to navigate our way to Krka national park. Croatia’s motorway is made up of toll roads so prepare to to pay dependent on how far you travel. It’s 33kn to Sibenik just for example. The roads are a treat, smooth and full of stunning views. 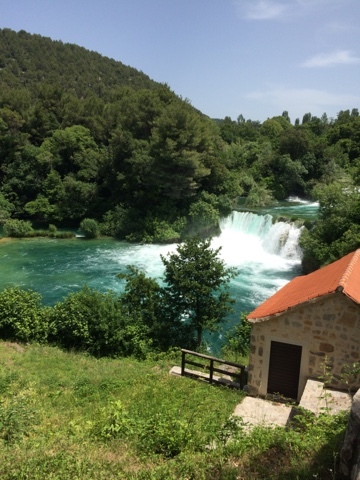 It’s really easy to find Krka national park. When you arrive there’s lots of free parking car parks, however we were both a little dubious of ‘free’ so we went to the car park right next to the national park Skardin entrance. It’s only 7kn an hour. You have to buy a ticket to enter the park, it’s 110kn per adult and this gives you a free ride on the boat along to the waterfalls. As we have a 7 month old, we took the pushchair and it was an ok choice. 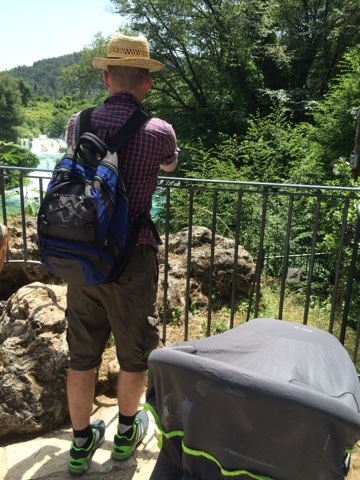 If you have a carrier, it’s a good idea although it was sooo hot that letting him sleep in the pushchair with a cover was worth the 250 steps encountered. Probably our best purchase was a Koo-di sun cover. It blocks our the sun, gives some cool shade and a little darkness for naps. So glad we purchased this at the last minute! The park itself is stunning, mind blowing. Waterfalls a plenty! There were quite a few people at the park, but not enough for it to bother you or get in the way. The views all along the 2 hour walk were just breathtaking. 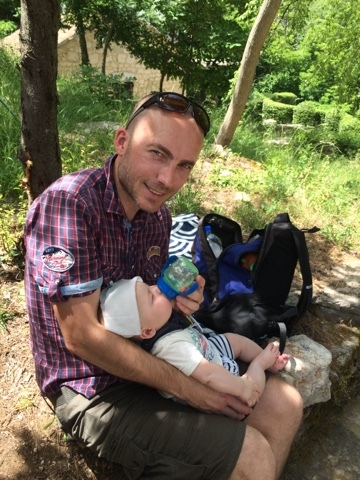 We had to stop a few times for food and nappy change, but the park is set up perfectly for nice little breaks in the 39c heat!! 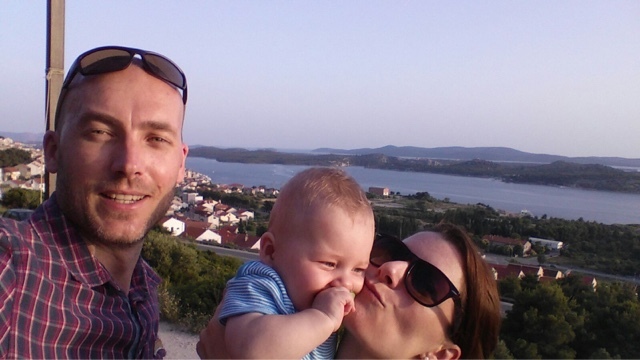 After leaving the park, we took the winding road to Sibenik to stay in another Air bnb. I guess the main reason we chose Air bnb over hotels was the option to have an apartment with a kitchen. This made life with a baby much easier as we are able to sort out his food, clean bottles and keep things cool in the fridge. Needed respite from the sun and some relaxing time in the air conditioning. Life saver. We then thought it was time to check out the beach. 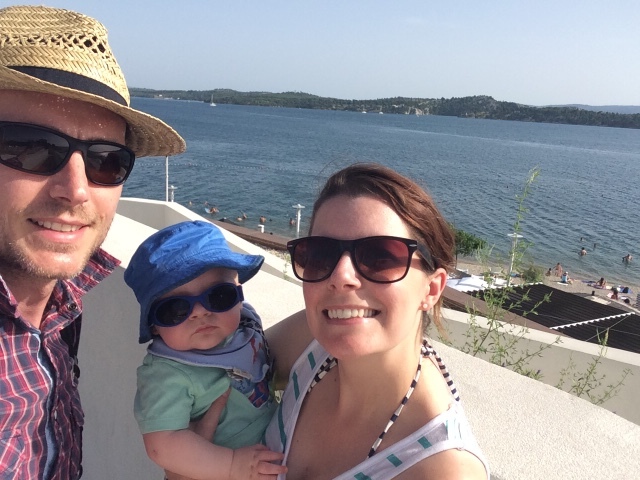 Sibenik has a stoney beach used mostly or maybe wholly by the locals so it was a fun experience for all. Of 5 minutes when Ethan decided enough was enough and screamed for the air conditioning! Terry and I grabbed a quick swim and back to the car it was! It took me until 9.15pm to get him to sleep this evening. His senses got the better off him. So much to see and do! 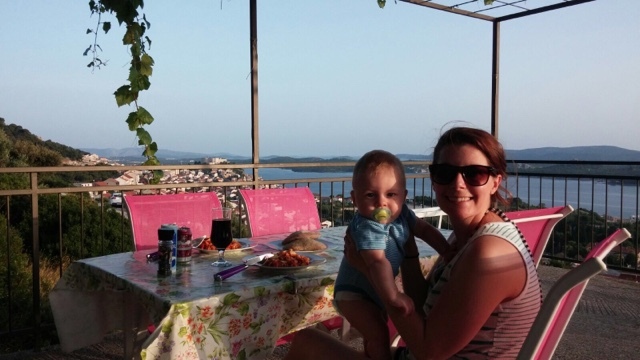 We made some dinner and sat on our private and huge terrace to watch the sun go down as a family. This is what happiness is made of. 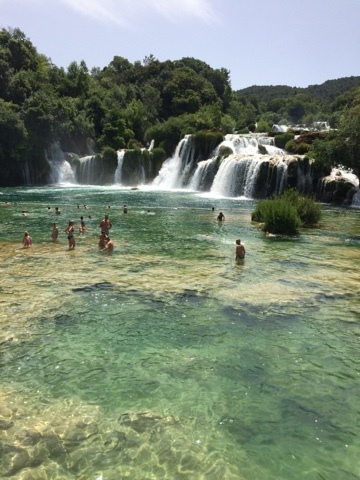 ← Croatia – the Constants have arrived!